Hurricane season is drawing to a close but fires and earthquakes, tornadoes, blizzards and other woes never go away, so it's never time to stop thinking about how to deal with emergencies. * Sleeping bag or warm blanket for each person. Consider additional bedding if you live in a cold-weather climate. * Complete change of clothing including a long sleeved shirt, long pants and sturdy shoes. Consider additional clothing if you live in a cold-weather climate. * Household chlorine bleach and medicine dropper – When diluted nine parts water to one part bleach, bleach can be used as a disinfectant. Or in an emergency, you can use it to treat water by using 16 drops of regular household liquid bleach per gallon of water. Do not use scented, color safe or bleaches with added cleaners. Of course, it depends on the time you have to get ready. It was interesting to see that some of the California wildfire evacuees took tens and camping gear with them to shelters. With the newer style tents that are free standing, they provided families with a modicum of privacy at a stressful time. Last year we gave our kids small emergency kits suitable for car or home. 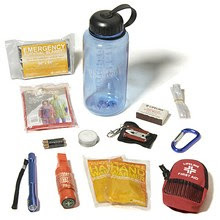 REI sells a nice "Survivor in a Bottle" kit for about $20. It has the virtue of being compact. Quake Pro offers up water in a box with a 5-year shelf life here. 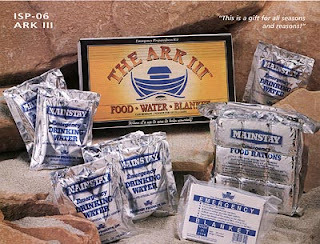 They sell personal-sized survival packages (3 days of food and water & a space blanket) for $21. See here. Water in 4 oz pouches available here 100 pouches for $30. 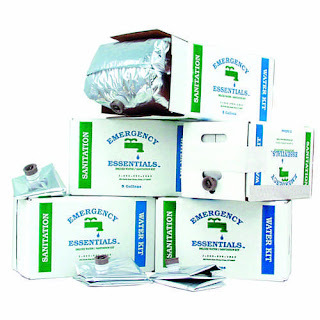 Emergency Essentials sells fill-it-yourself boxed water kits (25 gallons) for about $30, as well as many other useful items. 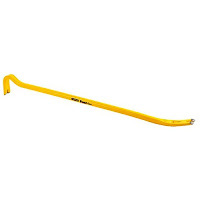 You might want to add a folding shovel to the kit - this place sells one for about $8. Good idea for travel in snow country. 5 2400-Calorie Food Bars, 15 8.5 Oz. Water Boxes, 5 Solar Blanket, 1 Pair of Work Gloves, 50 Purification Water Tablets, 12 Sanitary Waste Bags, 1 Pkg. 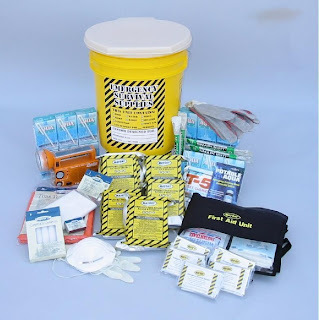 Sanitary Toilet Chemicals, 1 Box Waterproof Matches, 1 AM/FM Radio with Light & Generator, 4 12-Hour Light-sticks, 5 Dust Masks, 5 Tissue Packs, First Aid Kit, Latex Gloves, 5 Candles. Comes packed in 1 Port-A-Potty Bucket. Runs about $160 and weighs 26 pounds. 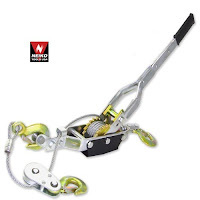 At slightly more than a pound in weight, and with dimensions of 6.5 x 5.75 x 2.25-inches (WxHxD), the FR200 is designed to be tucked neatly into its handy nylon carrying case and can be easily stored in an emergency box, or packed neatly for a camping trip. 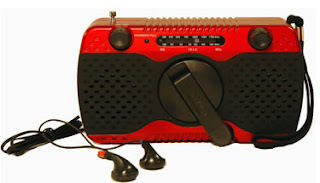 An LED flashlight is set on the front of the radio, just to the side of the analog tuner. 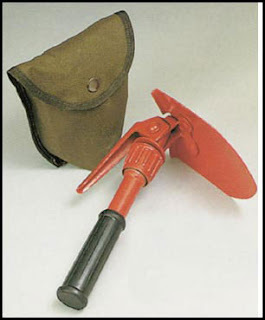 The flashlight is designed to help you down an unlit stairwell or enclosed hallway in a pinch, but the light is not directed or strong enough to help you much in a pitch-black forest or other open area. 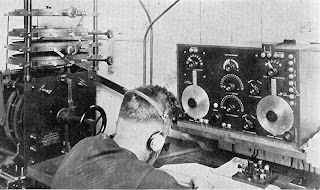 The radio and light can be operated simultaneously, though of course at the expense of power. Build a couple of kits for your cars and the house and rest a little easier. 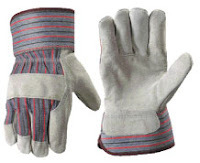 UPDATE: Leather work gloves for everyone are a good idea. and a "come along puller" (more on these here). Why the come along? To help move trees out of roads and things off other things - they take little space and can move a lot in a hurry. UPDATE: Some people seem to have been expecting a 30 meter wall of water to be breaking against the hotels of Waikiki Beach. They should count their blessings that it didn't turn out that way. With the distressing news of a major earthquake in Chile, tsunami warnings have gone out across the Pacific Ocean - including Hawaii and California. To ensure early detection of tsunamis and to acquire data critical to real-time forecasts, NOAA has placed Deep-ocean Assessment and Reporting of Tsunami (DART®) stations at sites in regions with a history of generating destructive tsunamis. 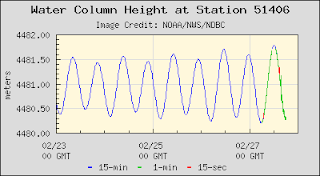 NOAA completed the original 6-buoy operational array ... in 2001 and expanded to a full network of 39 stations in March, 2008. Originally developed by NOAA, as part of the U.S. National Tsunami Hazard Mitigation Program (NTHMP), the DART® Project was an effort to maintain and improve the capability for the early detection and real-time reporting of tsunamis in the open ocean. See DART® development for more info. DART® presently constitutes a critical element of the NOAA Tsunami Program. The Tsunami Program is part of a cooperative effort to save lives and protect property through hazard assessment, warning guidance, mitigation, research capabilities, and international coordination. 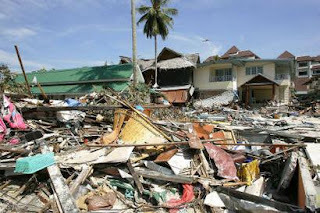 NOAA’s National Weather Service (NWS) is responsible for the overall execution of the Tsunami Program. This includes operation of the U.S. Tsunami Warning Centers (TWC) as well as leadership of the National Tsunami Hazard Mitigation Program. It also includes the acquisition, operations and maintenance of observation systems required in support of tsunami warning such as DART®, local seismic networks, coastal, and coastal flooding detectors. 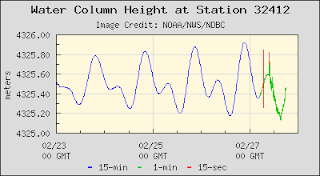 NWS also supports observations and data management through the National Data Buoy Center (NDBC). 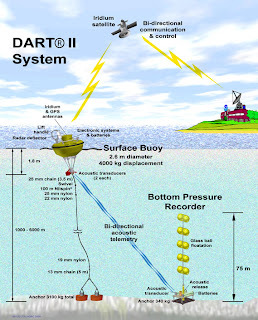 DART® systems consist of an anchored seafloor bottom pressure recorder (BPR) and a companion moored surface buoy for real-time communications (Gonzalez et al., 1998). An acoustic link transmits data from the BPR on the seafloor to the surface buoy. The BPR collects temperature and pressure at 15-second intervals. The pressure values are corrected for temperature effects and the pressure converted to an estimated sea-surface height (height of the ocean surface above the seafloor) by using a constant 670 mm/psia. The system has two data reporting modes, standard and event. 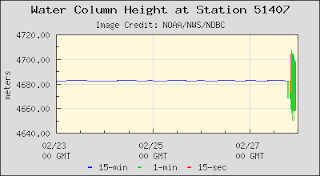 The system operates routinely in standard mode, in which four spot values (of the 15-s data) at 15-minute intervals of the estimated sea surface height are reported at scheduled transmission times. When the internal detection software (Mofjeld) identifies an event, the system ceases standard mode reporting and begins event mode transmissions. In event mode, 15-second values are transmitted during the initial few minutes, followed by 1-minute averages. Event mode messages also contain the time of the initial occurrence of the event. The system returns to standard transmission after 4 hours of 1-minute real-time transmissions if no further events are detected. The first generation DART® (DART I) systems had one-way communications from the BPR to the Tsunami Warning Centers (TWC) and NDBC via the western Geostationary Operational Environmental Satellite (GOES West) (Milburn et al., 1996). DART I became operational in 2003. NDBC replaced all DART I systems with the second generation DART® systems (DART II) in early 2008. DART I transmits standard mode data once an hour (four estimated sea-level height observations at 15-minute intervals). For information about the development of DART® technology, click here. DART II became operational in 2005 (Green, 2006). A significant capability of DART II is the two-way communications between the BPR and the TWCs/NDBC using the Iridium commercial satellite communications system (Meinig et al., 2005). The two-way communications allow the TWCs to set stations in event mode in anticipation of possible tsunamis or retrieve the high-resolution (15-s intervals) data in one-hour blocks for detailed analysis. DART II systems transmit standard mode data, containing twenty-four estimated sea-level height observations at 15-minute intervals, once very six hours. 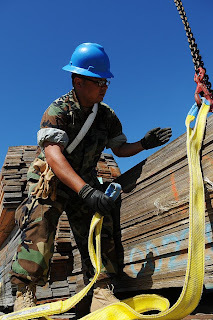 The two-way communications allow for real-time troubleshooting and diagnostics of the systems. The DART® buoys have two independent and redundant communications systems. NDBC distributes the data from both transmitters under separate transmitter identifiers. 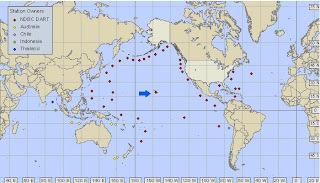 NDBC receives the data from the DART II systems, formats the data into bulletins grouped by ocean basin (see the NDBC - DART® GTS Bulletin Transmitter List, for a listing of the bulletin headers used for each transmitted identifier), and then delivers them to the National Weather Service Telecommunications Gateway (NWSTG) that then distributes the data in real-time to the TWCs via NWS communications and nationally and internationally via the Global Telecommunications System. The map near the top of this post shows the location of DART buoys and other buoys placed by other countries in this international effort to detect and warn of tsunamis and comes from here. In the deep ocean, a tsunami is barely noticeable and will only cause a shallow and slow ripple on the sea surface as it passes. As it approaches the land, however, tsunamis become much more of a hazard. When a tsunami approaches shallower waters near the coast, the waves slow down and become compressed, causing them to grow in height. Under the best case scenario, the tsunami comes onshore like a quickly rising tide and only causes gentle flooding in low-lying coastal areas. Under the worst case scenario, however, walls of water more than 100 feet high rush ashore causing large scale destruction and flooding — a cycle which may repeat itself many times before the hazard finally passes. Tsunamis typically cause the most severe damage and casualties near their source (i.e., earthquake) where the waves are the highest. Nearby local coastal populations — often disoriented from the violent earthquake shaking — may have very little time to react before a tsunami is generated and should move inland and to higher ground immediately. Larger, more powerful tsunamis can cause destruction and casualties over a much wider area — even across the entire Pacific Basin. However, because they are generated by more distant earthquakes and will make landfall several hours (as opposed to minutes) after an earthquake, NOAA and its partners are able to warn the public about these large regional tsunamis several hours before they strike, thus allowing adequate time for evacuation. The NOAA Weather Service operates two tsunami warning centers — the West Coast/Alaska Tsunami Warning Center in Palmer, Alaska, which has warning responsibility for Alaska, British Columbia, Washington, Oregon and California; and the Richard H. Hagemeyer Pacific Tsunami Warning Center in Ewa Beach, Hawaii, which conducts research and monitors tsunamis for Hawaii and both U.S. and international interests in the Pacific Basin. Both centers were established in 1967 and 1949, respectively, after damaging tsunamis hit those states. Together they are the operational centers of a vigilant 24-hour U.S. tsunami warning system for the Pacific Rim. Both centers work closely with state emergency managers, the U.S. Geological Survey and the Federal Emergency Management Agency to mitigate potential tsunami hazards. 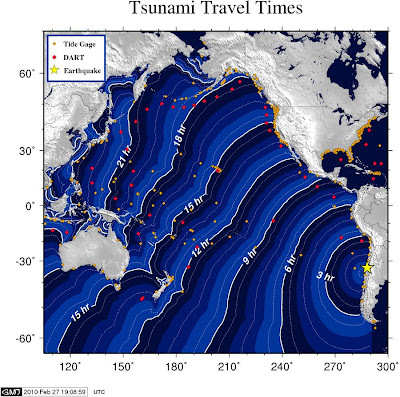 The NOAA Tsunami Warning Centers continuously monitor data from seismological and tidal stations, evaluate earthquakes that have the potential to generate tsunamis and disseminate tsunami information and warning bulletins to government authorities and the public. Despite this, however, it was not until DART that NOAA was able to accurately detect, assess and forecast the threat tsunamis pose to coastal communities. In 1997, the National Tsunami Hazard Mitigation Program provided funding for DART development. The DART project was developed by the NOAA PMEL and brought into operational use by the NOAA NDBC in October 2003. The DART project is an ongoing effort to maintain and improve the capability for the early detection and real-time reporting of tsunamis in the open ocean. DART also reduces costly false alarms — 75 percent of all warnings issued since 1948 have been for non-destructive tsunamis yet the evacuation of Honolulu in 1986 cost $40 million . 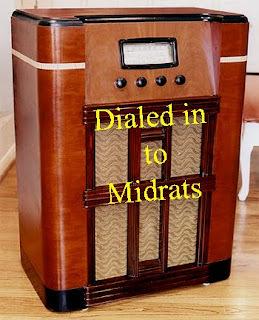 Obama to one of our former best friends, "Don't call us, we'll call you" or maybe it's "GFY" - as CDR Salamander notes in You can't vote "present" to history ..... Maybe he's still miffed about that Empire thing. Which, you know, never really affected him. The OIC (Organization of the Islamic Conference), in its 1990 “Cairo Declaration of Human Rights in Islam,” declares that “Everyone shall have the right to express his opinion freely” — but then adds: “in such manner as would not be contrary to the principles of the Sharia,” which is to say Islamic law as interpreted by Iran, Saudi Arabia, Libya, and other despotic members of this international religious/political alliance. Theirs is not a different view of freedom of speech: It is a death sentence for freedom of speech. And it is what they intend not only for the lands they now rule but globally. What does it tell us that they are finding so many people in the West willing — indeed, eager — to assist them? , "...reality doesn't feature rigged results." How To Clean Up the Tax Code by Bruce Bartlett - you know until the "Fair Tax" thing is implemented. So what do we need that we typically entrust the government to provide? Infrastructure -- repair of the old and expansion of the new. We need trillions of dollars of it, more than enough spending to replace the reduction in private sector demand that has occurred during this downturn. Two years, over a trillion dollars of wasted spending, and counting. Bridges, highways, waterways, building ships for the Navy, developing new aircraft, and budgeting for repair and upkeep of what we have all work for me. 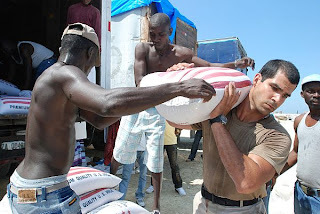 Secure Nation on How the Rise of Social Media Transformed Disaster Response in Haiti. Social media is a big topic in disaster relief circles. But you better have the bandwidth. Some of the things here could help. See also here for an example. You've seen the commercial about how trains take trucks off the highways? As the second Corps video makes clear, maintenance is required for this vital system. See here re Tombigbee and short sea shipping. See here re St. Lawrence Seaway. The 465 mile navigation system offered by the Columbia and Snake rivers, along with a small portion of the Willamette river at Portland, is made possible by a series of hydro-electric dams featuring navigation locks, four on the Columbia and four on the Snake. Among these is the lock at John Day Dam, which has a lift of 110 feet, the highest in North America. Deepwater shipping makes use of a 40-foot-deep channel, currently being dredged to 43 feet, to travel as far eastward as Vancouver, Washington, while a shallower 14-foot-deep channel accommodates barge traffic all the way to Lewiston. Ocean-going vessels make some 2,000 port calls on the river each year, trans-porting an average $16 billion worth of freight, while ships and barges together move about 17 million tons of cargo annually. San Francisco is fed by the Sacramento River and its ship channel as well as the Stockton channel from the Port of Stockton. Some of the obstacles to short-sea shipping noted in these studies, and by other sources, are slowly being addressed, while others may simply bea fact of life. 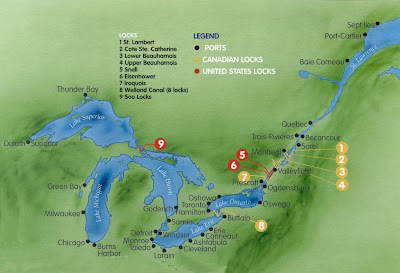 In September 2009, the U.S. Saint Lawrence Seaway Development Corporation (SLSDC) and its counter-part, the CanadianSt. Lawrence Seaway Management Corporation (SLSMC), went on a fact-finding mission to Europe to determine why short-sea shipping was so successful in that part of the globe, but far less so in North America.U.S. and Canadian regulatory barriers were discovered to be one of the biggest obstacles, including cabotage and tax laws. The U.S. has theJones Act and Canada has a 25% tax on non-Canadian built / flagged ships. These laws, especially the Jones Act, can be touchy subjects, but Terry Johnson, SLSDC Administrator, said, “I think we can be honestand straight forward and say that they are big barriers to having short-sea shipping take off.” Johnson reported that Canada is in the process of repealing its 25% tax, at least for vessels of a certain size. “On our side,of course,” he said “the Jones Act isn’t going anywhere.”The America’s Deep Blue Highway study demonstrated that it’s a game of give and take, as Europe already knows. The study noted that “this impressive use of coastal shipping has come with some pain because liberalizing Europe’s domestic shipping market has been accompanied by‘flagging out’ by some operators and a loss of European shipboard jobs to lower wage foreign competitors.” Weitz said the crewing and flagging of a vessel have very little impact on the cost — it’s the price of building vessels in the U.S. that puts short-sea shipping at a significant disadvantage to trucking. Trucks on U.S. roadways can be built anywhere in the world. When you read the article (highly recommended) you might note the effects of tax and labor union issues in impeding development of short sea shipping. UPDATE: On the Intracoastal Wateway here. 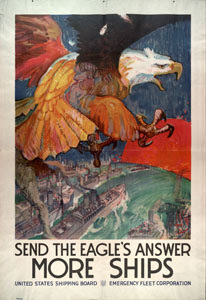 The GICA was organized in 1905, to promote the idea of a single channel that would connect all major Gulf coast ports. This very idea materialized some 44 years later, with the formal completion of the Waterway in June, 1949. A significant engineering achievement, the Waterway's creation was made possible only by the cooperative efforts of communities, legislators and government agencies, working together toward a common goal. From its early days, the GICA educated these groups regarding the importance of the Waterway, and facilitated their collaboration. 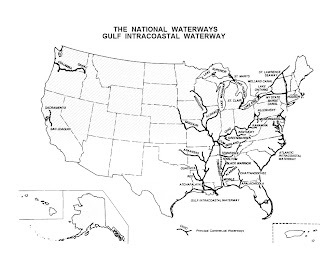 The Atlantic Intracoastal Waterway (AIWW) extends 1200 miles from Norfolk, Virginia to Key West, Florida. Some lengths consist of natural inlets, salt-water rivers, bays, and sounds; others are man-made canals. Congress authorized the creation of the AIWW in 1919 and the entire waterway was completed in 1940. North Carolina - $4,750,000 This funding will allow the Corps to complete most necessary maintenance dredging and provides $750,000 to begin Phase II of the Dredged Material Management Plan (DMMP) for NC, SC, and GA. FL already has a DMMP and AIWA is the force behind the development of such a plan for the other waterway states. South Carolina - $900,000 $490,000 is for maintenance dredging. Much less than the $6 million needed for the SC portion. Georgia - $265,000 In 2009 GA received $6 million in Stimulus funds to dredge several neglected portions. However, the lack of a disposal area prevented the Corps from dredging in Creighton Narrows, Little Mud River and Jekyll Island Reach. The DMMP will help solve the spoil site problem in the future but this river needs dredging now. The Corps and DNR have been able to work out an agreement with the Port of Brunswick for a one-time use of their disposal site. This budget amount does not include any funding for dredging in FY11. The Corps needs $6 million to properly take care of this section of the waterway. Florida - $350,000 This amount would be laughable if is wasn't so serious. The AIWW in Florida annually brings in $18 billion in revenue to the state and federal government. Florida needs $15 million to maintain its waterway. It is the major river of North America and the United States at (2,339 miles) (3,765 km) in length. It flows from northwestern Minnesota south to the Gulf of Mexico, just below the city of New Orleans. 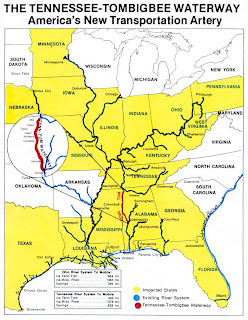 It is a significant transportation artery and when combined with its major tributaries (the Missouri and Ohio rivers) it becomes the third largest river system in the world at (3,877 miles) (6,236 km) in length. It begins in southern Montana in the Rocky Mountains, first flowing north then generally southeast across the heart of the United States, ending at the Mississippi River, just to the north of St. Louis, Missouri. It is the longest river in the United States (2,500 miles) (4,023 km). Formed by the confluence of the Allegheny and Monongahela rivers in Pittsburgh, Pennsylvania, the Ohio flows generally southwest. It forms the natural borders of Ohio and West Virginia, Ohio and Kentucky, as well as parts of the borders of Indiana, Illinois and Kentucky. It empties into the Mississippi River at the Illinois border and is (975 miles) (1,569 km) long. 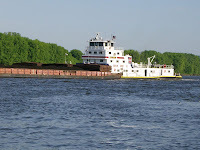 Once extended by the Erie Canal, the Hudson became the principal artery of an interstate transportation system that connected the Ohio and Mississippi Valleys, the Port of New York and the markets of the world – barge by barge by barge. At first, barges were individual cargo vessels pulled by mules or current. The marine steam engine made it possible to tow a train of barges up or downstream, on a reliable schedule. The marriage of barge and railroad was inevitable and the two powered the growth of the Empire state. 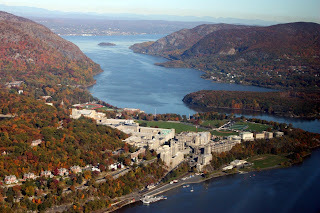 Of course there is school now located where there once was an important fort that protected the Hudson River from the British fleet. It was that because of that fort at West Point on the Hudson that Benedict Arnold turned traitor to the American cause to try to surrender it to the Brits - which would have severed the colonies . . . and allowed the British considerable freedom of movement. Somali Pirates: Hmmm . . . is a pirate port blockade coming? The European Union says its flotilla combating piracy off the Somali coast will intensify surveillance of pirate ports and hunt motherships that act as logistics bases for the pirates. Spanish Defense Minister Carme Chacon says EU defense ministers meeting here agreed to strengthen controls over pirate bases in coming months. She did not elaborate how this will be achieved. The Somali pirates seem to be aware of limits on their behavior, judging by their relatively low ransom demands and the efficiency with which ransom negotiations take place. With the rare exception, the pirates have not killed hostages. Excessive demands or murdering hostages invites a more vigorous response. The occasional raid, like those recently conducted by the French, may serve to remind the pirates that their continued existence hangs by a thread. This is part of the process of establishing bounds on pirate behavior which, if crossed, invite a swift and deadly reaction. Containment involves limiting the damage that can be caused by pirates. This can be carried out by naval patrols, convoys, establishing safe routes and blockades of pirate ports, the very sort of activity we now see by naval units in the area. Drones, patrol aircraft and lots of small fast boats to run down anything that leaves known pirate hangouts. UPDATE: This might be useful. Several of them would be useful. THE EU’s flotilla combating piracy plans to turn up the heat on pirate bases in the next few months, its spokesman told Fairplay today. 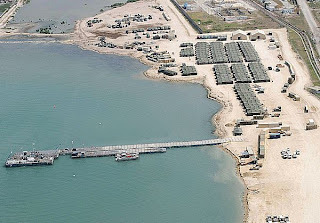 Royal Navy Commander John Harbour, speaking for EU NAVFOR, said EU surveillance of the bases would increase as Spain announced that EU defense ministers have agreed to stiffen measures against onshore pirate redoubts. WIN Group, the Haitian enterprise that owns and operates Terminal Varreux in Port-au-Prince, and SEACOR Holdings Inc. ... announced that emergency repairs have enabled crucial tanker shipments of fuel to resume to Haiti. Restoration of Terminal Varreux's marine operations included the installation of an interim vessel mooring system, the repair and testing of critical piping systems and the revision of terminal operating procedures. Additional emergency construction at Terminal Varreux is also providing the capability to receive containerized cargoes, furthering recovery efforts. The first tanker began discharging its initial load of fuel at the restored berth on Friday, February 5. The shipment was completed in the early morning hours on Sunday, February 7 and the vessel has departed from the terminal. "We are all taking a deep breath now that the fuel supply to Haiti has been restored," said Youri Mevs, managing partner of WIN Group. "Without fuel the recovery effort is clearly paralyzed. We commend SEACOR for mobilizing so quickly to address this dire situation, as well as WIN Group's staff in Port-Au-Prince. They all worked around the clock through very challenging circumstances. 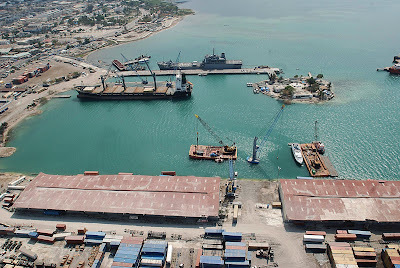 As a result, Terminal Varreux will continue its role as a key element of Haiti's long-term recovery efforts." Terminal Varreux is located five miles from the epicenter of the devastating January 12 earthquake, and suffered damage to its piers and facilities, but the bulk of the port's 18 storage tanks were undamaged. Terminal Varreux's tanks have a total capacity of approximately 45 million gallons. - WFP and partners have reached over 3.7 million people with food assistance since the start of the response; some 102 community out-patient care centres for the treatment of severely acute malnutrition, along with 18 mobile units, are operating throughout the country. - WASH partners are currently reaching 850,000 people with 5 litres of water a day, covering 83 per cent of the target population. . . 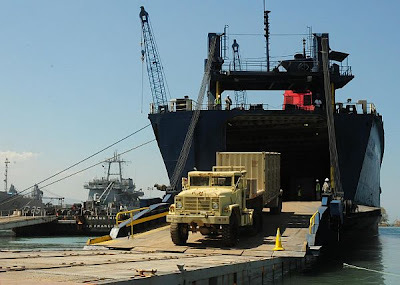 The British amphibious landing ship Royal Fleet Auxiliary Largs Bay arrived off Haiti loaded with essential stores and equipment in aid of the earthquake victims yesterday, Thursday 18 February 2010. The ship's mission is on behalf of the Department for International Development, Save the Children and the International Federation of Red Cross. The 16,160-tonne ship sailed from the Sea Mounting Centre at Marchwood, near Southampton, on 3 February tasked with delivering bulky items that are not suitable for air freight. Her cargo includes 5,700 sheets of corrugated iron to build much-needed shelters, 40 vehicles and 15 containers of general stores. Hat tip to Lee and Charles. "The crew of the USS FRANKLIN (CV-13) will hold their 2010 reunion from the 18th to the 21st of March, in Branson, MO. Special event: Memorial service morning of 19 March. This will be held on the 65th anniversary of the attack off the coast of Japan. These men who went to war, preformed well, suffered a horrible blow, yet sailed their ship home may not be around much longer to share their stories. If you’re close by, I’m sure they wouldn’t mind a visitor or two who would thank them and listen to a story of two for history’s sake. Take your camera and notepad and post the things you learn!" USS Franklin, a 27,100 ton Essex class aircraft carrier, was built at Newport News, Virginia. Commissioned at the end of January 1944, she arrived in the Pacific in time to participate in later stages of the Marianas operation. 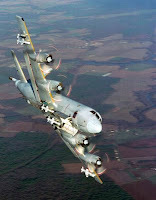 From late June into September, her planes conducted strikes on enemy targets in the Bonins, Marianas, Palaus and Carolines. In October, after supporting the September landings in the Palaus, she took part in the Third Fleet's raids in the Western Pacific and in the Battle of Leyte Gulf. She was lightly damaged by a Japanese bomb on 15 October, and was hit by a suicide plane on 30 October. The latter caused serious damage and killed 56 of her crew, necessitating a trip back to the United States for repairs. 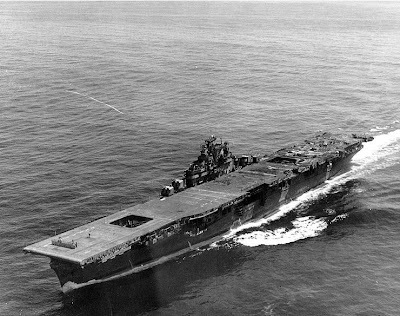 Franklin returned to the war zone in mid-March 1945 and joined the Fifth fleet for strikes on the Japanese home islands. On the morning of 19 March, while her flight and hangar decks were crowded with fully armed and fueled planes preparing to take off to attack the enemy, a Japanese plane approached undetected and hit the carrier with two bombs. The resulting inferno badly damaged the ship and resulted in the deaths of 724 of her crew. Heroic work by the survivors, assisted by nearby ships, brought the fires and flooding under control. After a brief period under tow, Franklin's engineers again had her steaming on her own. The badly damaged carrier crossed the Pacific, transited the Panama Canal and in late April arrived at the New York Navy Yard for repairs. These were completed shortly after the end of the Pacific War, and Franklin saw no further active flight service. She decommissioned in February 1947. Naval historians and those who wish to honor a brave ship and crew are invited to attend. Piracy: A Discussion on "Anti-Piracy Hardware: Keeping Ships Out of Harms Way"
Claude Berube is featured, as he was one one of our Midrats shows. The Korean people are too pure-blooded, and so too virtuous, to survive in this evil world without a great parental leader. 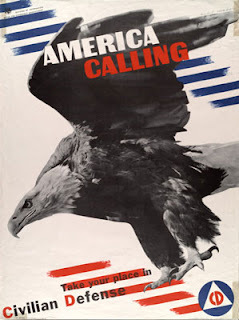 This paranoid nationalism might sound crude and puerile, but it is only in this ideological context that the country's distinguishing characteristics, which the outside world has long found so baffling, make perfect sense. 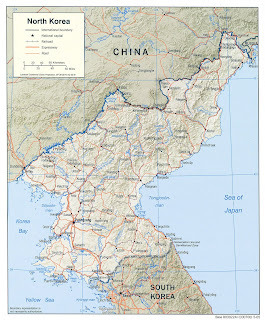 Up close, North Korea is not Stalinist -- it's simply racist. Because the winds are down,making small boat operations easier. See Sailing: Gulf of Aden | Wind Charts. (U) Weather continues to hinder small boat operations in the Horn of Africa (HOA) region as the northeast (winter) monsoon continues. However, it is likely that a few pirate groups will still get underway and try to hijack ships as shown by the continued activity in the Gulf of Aden. Recently, pirates have used currently hijack dhows as motherships to get underway and conduct operations. Mariners are warned that although we do expect a decrease in overall pirate activity in the HOA region, the possibility of pirate attack is still high, and mariners should continue to maintain all counter-piracy measures when transiting the area. 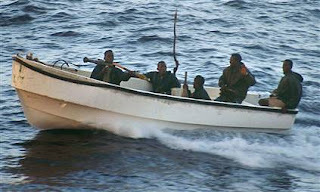 Somali pirates currently hold fewer vessels for ransom than they have shown the ability to hold. 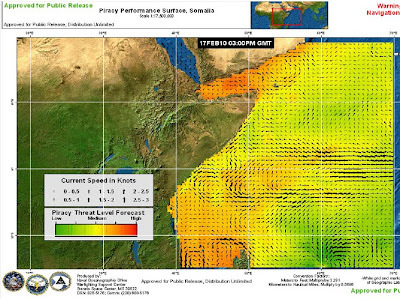 This week, ONI assesses the risk of pirate attacks is moderate in the Indian Ocean. Please note pirates south of the equator in the Indian Ocean have demonstrated the ability to operate in the capability range of Medium. In addition, the area due east of Socotra Island out as far as 600NM off the Socotra is still considered high risk and mariners are warned to avoid this area if possible. The area northeast of Seychelles is also still considered very high risk. The Gulf of Aden remains a prime operating area for Somali pirates. Somali Pirates: CTF 151 Stops Attack, Apprehends 8 "Suspects"
MANAMA, Bahrain – Coalition warships from Combined Task Force (CTF) 151 have apprehended suspected pirates in the Gulf of Aden. 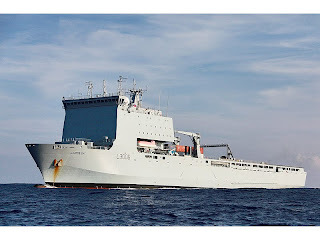 The Tanzanian-flagged MV Barakaale 1 came under attack whilst transiting through the region and the timely response by the Master in alerting vessels in the region by bridge-to-bridge radio communication enabled ships from CTF 151 to come to its aid. A SH-60B Seahawk helicopter, from USS Farragut, was immediately dispatched to the MV Barakaale and subsequently gave chase to the skiff which withdrew its attack. During the pirate attack on the MV Barakaale 1, the crew adopted defensive maneuvers which resulted in a suspected pirate falling overboard whilst attempting to board the vessel. The skiff rescued their accomplice and attempted to board MV Barakaale a second time, but they were again unsuccessful. The helicopter intervened and the skiff attempted to speed away. After repeated warnings to the skiff, warning shots were fired by the helicopter across the bow of the skiff, which resulted in its coming to a stop. 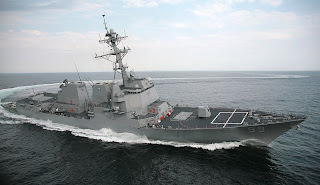 A boarding team from USS Farragut boarded the vessel and the eight suspected pirates were taken aboard the Farragut. The quick action by CTF 151 and the crew of the Barakaale prevented a successful pirate attack from occurring. Commander, CTF 151, Rear Adm. Bernard Miranda, Republic of Singapore Navy, applauded the effort by all parties in coordinating the response to the incident. “The merchant community has clearly demonstrated that they can defend themselves by being the first line of defence against piracy by adopting the recommended ‘best management practices’. A helicopter from USS Farragut was able to be dispatched and go to the aid of the MV Barakaale and subsequently gave chase of the skiff. The Master of the Barakaale did the right thing by not stopping his vessel and adopting non-kinetic measures like evasive maneuvers, to deter the pirates from getting on board,” Miranda said. The leading group of pediatricians in the United States is pushing for a redesign of common foods such as hot dogs and candies, along with new warning labels placed on food packaging, to help curb sometimes fatal incidents of child choking. Now, I'm a big fan of protecting children from hazards - but view that job as one best performed by parents - you know - unless there are mass deaths resulting from a risk not controllable by parents. How big is the risk posed by cylindrical or round hot dogs, carrot sticks and hard candy? Are we killing thousands of kids or what? * In 2000, 160 children ages 14 years or younger died from an obstruction of the respiratory tract due to inhaled or ingested foreign bodies. Of these, 41% were caused by food items and 59% by nonfood objects (CDC, unpublished data). * For every choking-related death, there are more than 100 visits to U.S. emergency departments. In 2001, an estimated 17,537 children 14 years or younger were treated in U.S. emergency departments for choking episodes. o Sixty percent of nonfatal choking episodes treated in emergency departments were associated with food items; 31% were associated with nonfood objects including coins; and in 9% of the episodes the substance was unknown or unrecorded. o Candy was associated with 19% of all choking-related emergency department visits by children ages 14 years or younger; 65% were related to hard candy; and 12.5% were related to other specified types of candy (chocolate candy, gummy bears, gum, etc.). The type of candy was not specified in the remaining 22.5% of the cases. Candy was associated with 5% of all choking-related visits for infants less than one year of age; 25% of visits for children ages 1 to 4 years; and 28% of visits for children ages 5 to 14 years. o Coins were involved in 18% of all choking-related emergency department visits for children ages 1 to 4 years. o In 2001, 10.5% of children treated in the emergency department for choking episodes were admitted to the hospital or transferred to a facility with a higher level of care. So, in one year, a total of 160 kids 14 years and younger died due to respiratory tract obstruction. That's sad, but it is not an epidemic. Further, of these 160, 41% or 65 children died because the obstruction was "food items." Now, "food items" might include hot dogs - or it might not- it could include grapes, apples or chunks of steak. I should note that grapes are troublesome because they, like insufficiently chewed/chopped hot dogs or hard candy, can form a seal at the back of a throat. What we can infer from emergency room visits is that 19% of the 65 food related deaths, or roughly13 deaths a year involve "candy." Of these, we can further infer that "hard candy" was involved in 8 deaths. Risk of choking is very low in children. The risk is highest in the oldest, but even in the oldest old the annual risk of death by choking is less than 1 in 1,000. All of us will choke from time to time - eating too fast or too much, a cold, a laugh, something that surprises us, or no good reason. Few will die. However, fear of choking, especially in the young, has meant a rush of safety notices, especially catching Bandolier's eye in restaurants in New York city. The implication of these notices was that children were at particular risk, so we thought we would look for the evidence. Data were available by age from the National Safety Council in the USA. If you root around on their website you can find a downloadable report on all causes of deaths in the USA - slightly more readable than the British version that uses codes. It allows calculations of risk in terms of 1 in X per year. Figure 1 shows the results for choking deaths, with the annual risk of death in a motor vehicle for a comparison. Choking deaths are clearly age-related, while those in motor vehicles, by and large, are not. The greatest risk of death by choking is in the oldest old. It appears from the chart that children under 14 may actually be at a lower risk of choking than older people. So, in an eight year period in Maryland, 6 deaths (50% of the total deaths) involved hot dogs. Eight deaths involved "nonfood objects." Under these facts, the logical thing to do would be to ban "nonfood objects." These include balloons and coins. In any event, reshaping the hot dog, even if it's "up to the manufacturers to figure out the specifics," seems a bit extreme. Parents- chop up or break up childrens' food -especially hot dogs, grapes, cherries, popcorn, chicken nuggets and the like. And, as you get older and don't chew quite as well, you ought to do the same for your own food. 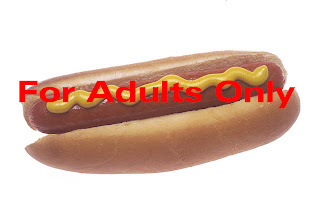 The rest of us can eat hot dogs just as they are, provided we chew our food. 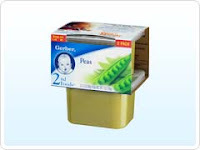 Or we can all revert to strained peas, carrots and beets. Maybe we'll live forever. Except for car wrecks, cancer, heart disease, etc. 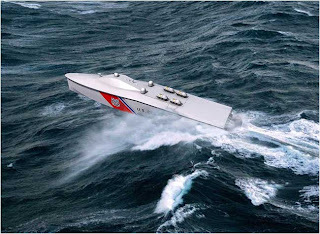 Somali Pirates: Update on "Asian Glory"
Somali Pirates: "U.S. Navy Ship Draws Fire"
Maritime Security: Navy UAV Strike Force? Happy 100 years, Boy Scouts of America! Seaborne terror mines from Hamas? Somali Pirates: Car Carrier as Mother-ship?